If you haven’t already heard the news: we’re doubling down in the beach house department. And I mean the “double” part quite literally because we lost our minds and bought a DUPLEX! If you caught our podcast yesterday, you already know the whys, hows, and wheres of this story. 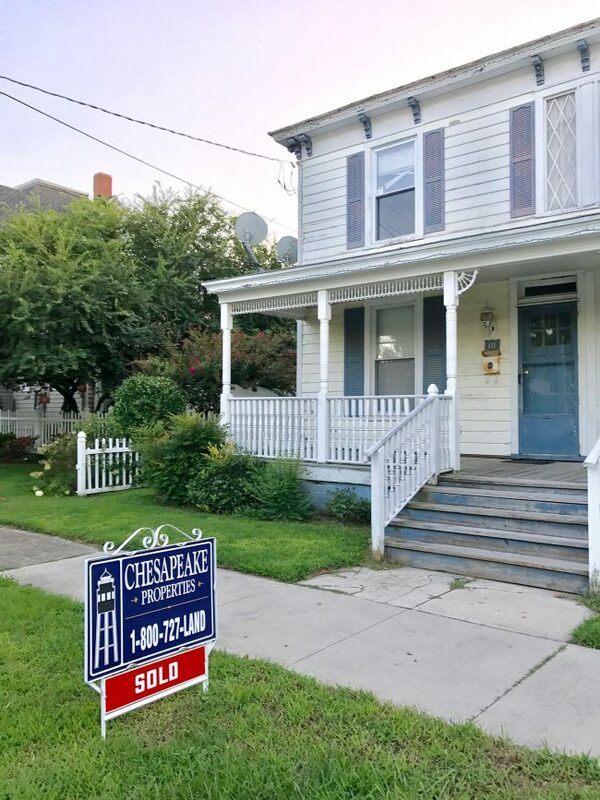 The price was right (we even got them down 30K), the location is awesome (close to the park, shops, and a few blocks from the beach), and we didn’t feel like we could ever afford this much house in such a great spot if we waited much longer. 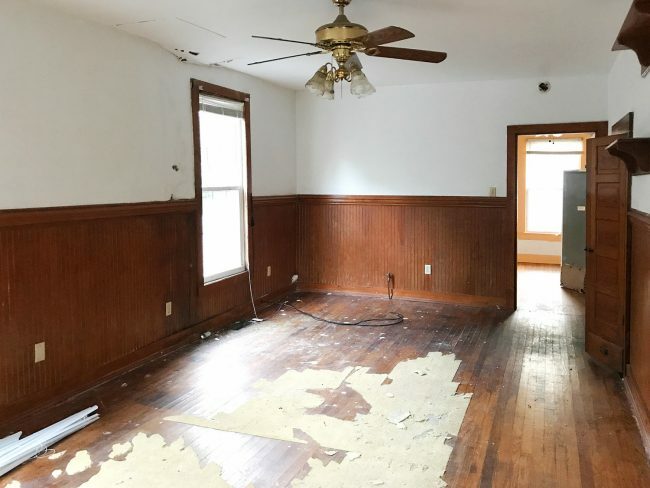 This small town only has so many affordable fixer-uppers available before everything gets renovated and we get priced out (we paid $220K for this, which breaks down to $110K per side – which is cheaper than the pink one!). But there’s lots more of the story in the podcast (you can listen in the player below) including how it took us a few weeks to come around to its charm and how we’re making this all work financially (spoiler: we were able to pay off our mortgage here in Richmond – and we share specifics about exactly how we did that). But if you just haven’t had a chance to listen yet, here are tons of details, photos, and even two video tours for you. 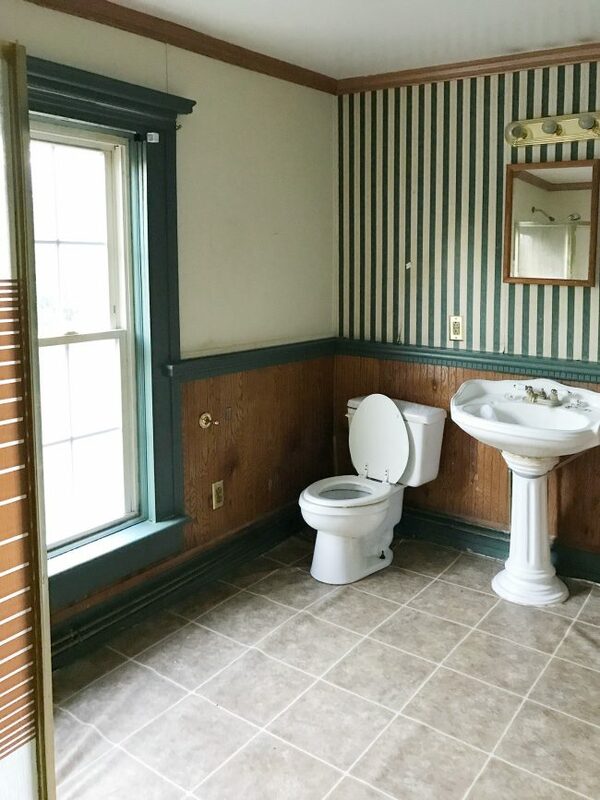 #SoMuchMoreToTile #LonelyToilet #Also,WhoHidesWindows?! 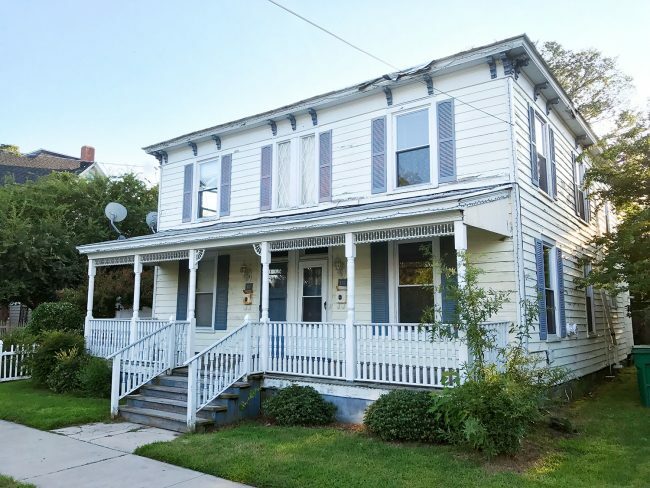 This is another historic fixer-upper in the quaint Chesapeake Bay-side town of Cape Charles on Virginia’s Eastern Shore. 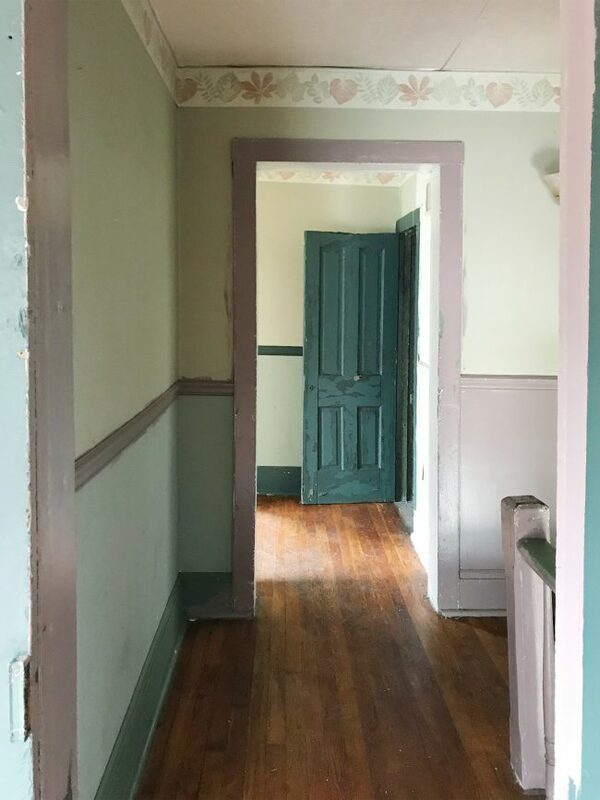 We talked more about why we’ve fallen hard for Cape Charles back when we shared our pink house purchase last year (and I’ll be calling it the “pink house” in this post for clarity’s sake). Not only is the duplex in the same town as our pink house, it’s actually on the same street – just two doors down! Yep, our two houses are separated by just one home (the one that was featured on HGTV). This street was a big part of why we bought the pink house thanks to its proximity to the shops/park/beach, so location was also a HUGE reason that we were attracted to the duplex. We’ve always known the pink house wouldn’t be our last big project, but I can’t say we were expecting to dive into another one quite this quickly. 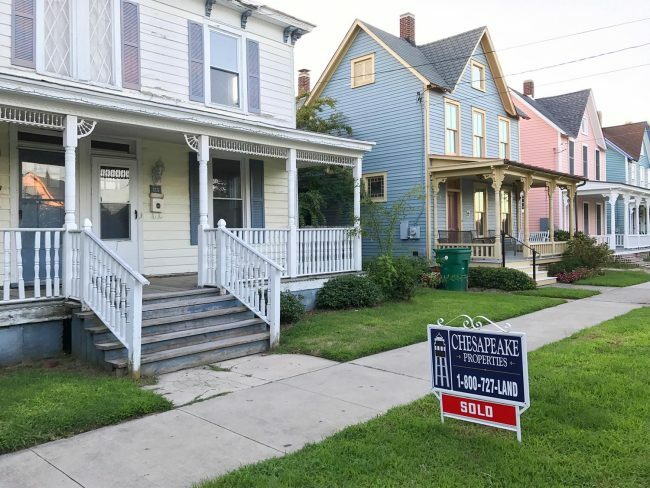 But over the months of working on our pink house, we noticed how limited the inventory was for houses in Cape Charles that fit our price range. So the good location and price of this duplex accelerated our plans a little bit – and despite our initial aversions to this house, we just couldn’t fight that feeling anymore. We wanted the dang duplex. Badly. It creates additional vacation rental opportunities. 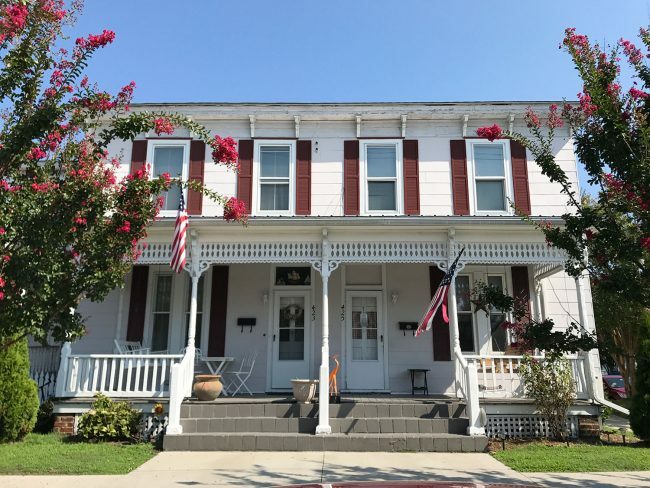 We won’t use this ourselves, so it creates two spaces dedicated solely for renting to others – great for times when we plan to stay at the pink house, but still want to earn rental income. It accommodates larger groups or pink house overflow. Our pink house is 3 bedrooms (4 if you count the bunk room) but all together, we’re hoping to create 6 bedrooms in the duplex. So groups that can’t squeeze into ol’ pinkie could rent both sides of the duplex instead. We also may use it when our own extended family or friends want to vacation with us, which is pretty handy since it’s so close. Renovating a duplex can be more efficient. Although we have double the kitchens and baths to redo (oh the tiling! THE TILING!! ), many of the big tasks – like replacing the roof/siding, foundation fixes, or landscape updates – are a lot more cost effective and time efficient because we can do them all at once, whereas it may have taken us a few years to fix up two separate houses. 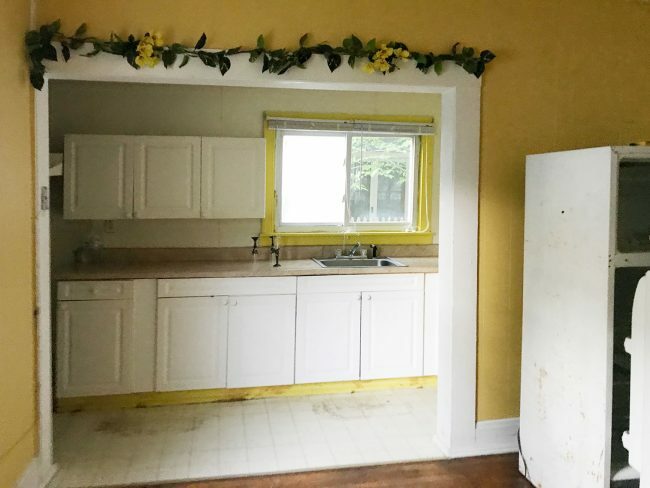 Plus, having already established our go-to contractors in Cape Charles and worked out some of the kinks of the process while doing the pink house, this project seems a LOT less daunting than our first go ’round. 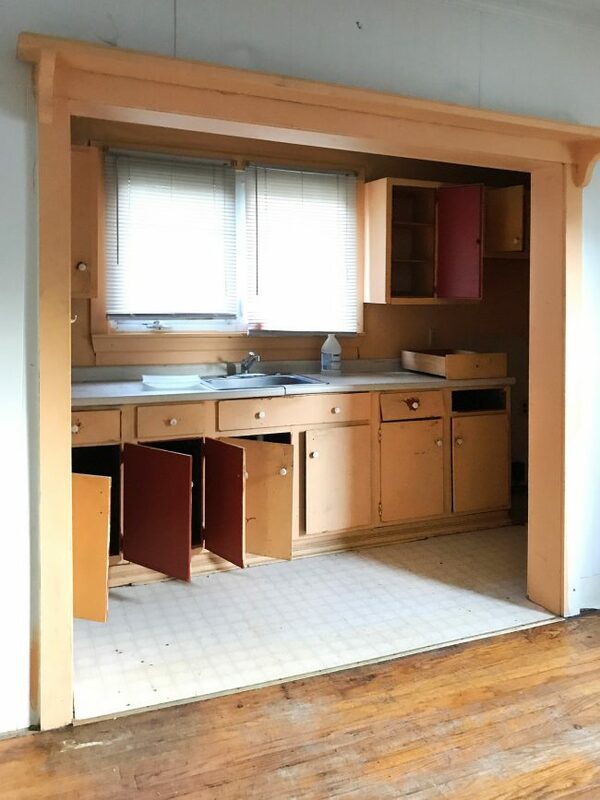 The duplex is split right down the middle, with each side being a mirror of the other in layout, but NOT in condition, look, or….um…smell. One side smells exactly like the apartment I rented in Queens for a year (and no, that is not a compliment). 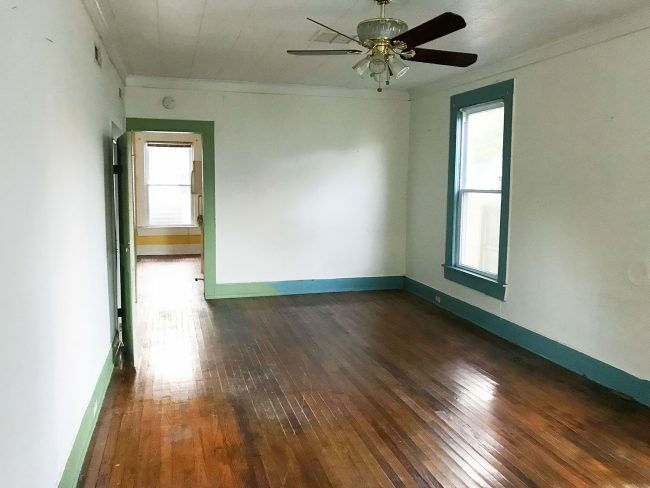 The home had previously been a long-term rental property but the tenants on both sides moved out earlier this summer before the owner listed it for sale. So let’s start with a video tour of the LEFT SIDE, since it’s the one we previewed in our podcast show notes yesterday. *Note: if you’re viewing through a feed reader, you may need to click through to see the video player. If you can’t watch the video right now, I’ve got photos below – but first here’s the (shorter) video tour of the RIGHT SIDE, which is in slightly better condition. Oh, and be warned, there’s a smoke detector beep in this one, so if you’ve got a dog who freaks out at the stuff (we’re speaking from experience) you might want to throw on some headphones. *Note: if you’re viewing through a feed reader, you may need to click through to see the video player. As you saw in the videos, both sides open right into the stairwell. 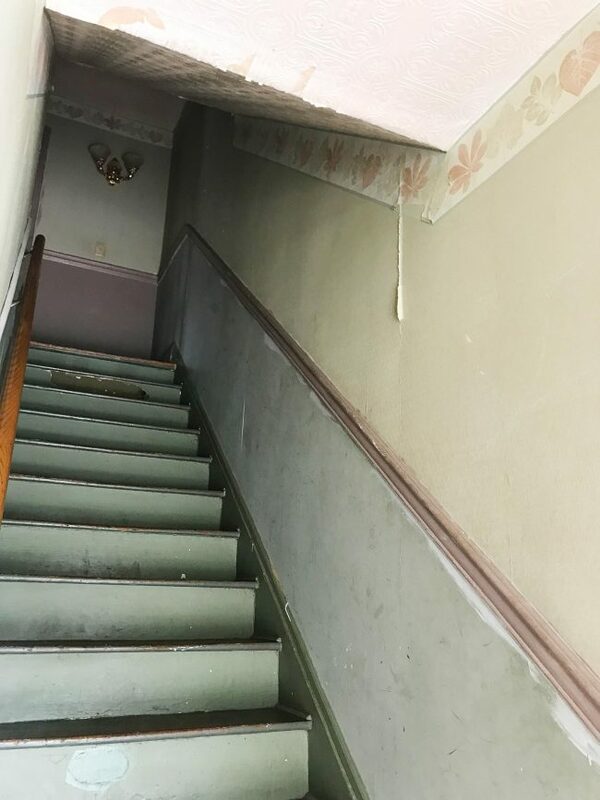 We’re hoping we can open up the wall to the living room to let more natural light into the stairs and make them feel less cramped. You know, sort of like this. From the doorway, you can step into the living room, which is pretty decently sized. The floors are in better shape than they look, so we know they’ll refinish beautifully (don’t mind that carpet pad that got stuck to them). And see that bubbled part of the ceiling to the left of the fan? That’s a leak with some mold on it. It continues down the wall and there’s actually a hole above that paneling that’s so big you could stick your arm into it. You could but I’m not volunteering. Beyond the living room is a dining room of sorts, which has a narrow galley kitchen attached to it. 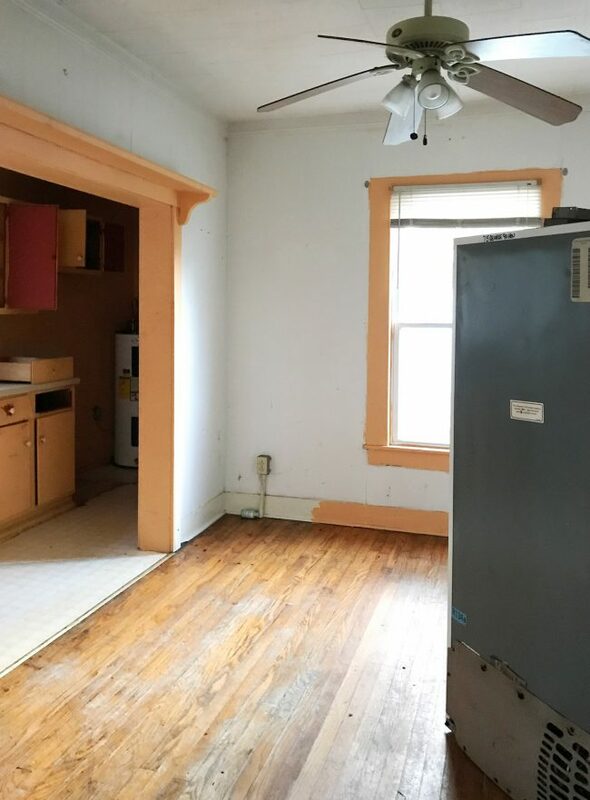 Spoiler alert: we will not be keeping that fridge location or the trim color. The kitchen is in rough shape. 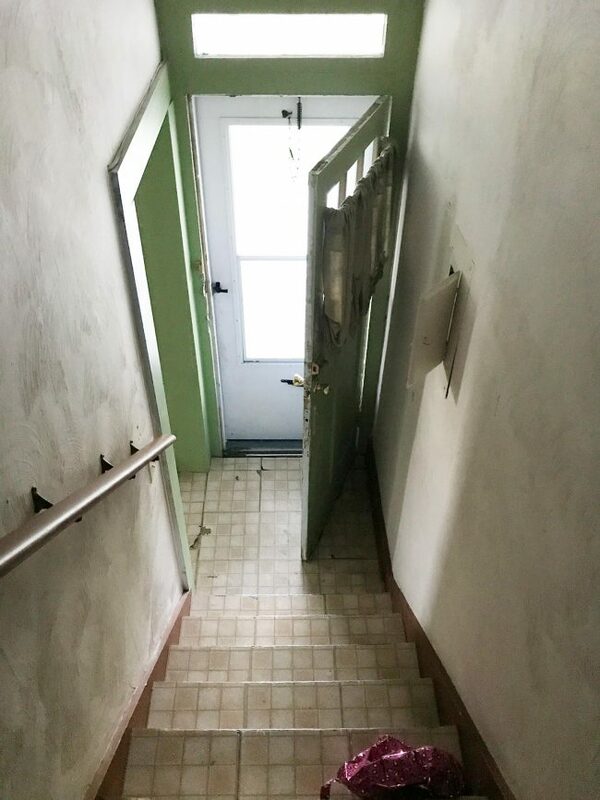 It appears to be squeezed into a former side porch area and connects to a small dark hallway in the back with an old water heater and a door that leads to the backyard. So we definitely want to rethink this layout to make it more functional. Actually we want to tweak the entire downstairs layout so it’s more functional. Sherry mentioned trying to add a bedroom down here in the video, but since recording that we’re brewing another plan that’ll keep all the bedrooms upstairs and result in a larger kitchen, living room, dining room, bathroom, and laundry area down here instead. What’s that old saying? “Your first idea is rarely your best idea.” Truth. Moving along… there are two bedrooms and one full bath upstairs right now, all of which are off of this little landing at the top of the steps. The back bedroom got the same wood paneling treatment as the front bedroom (it’s just painted white) along with the same foam square ceiling panels that have been glued over the actual drywall or plaster. 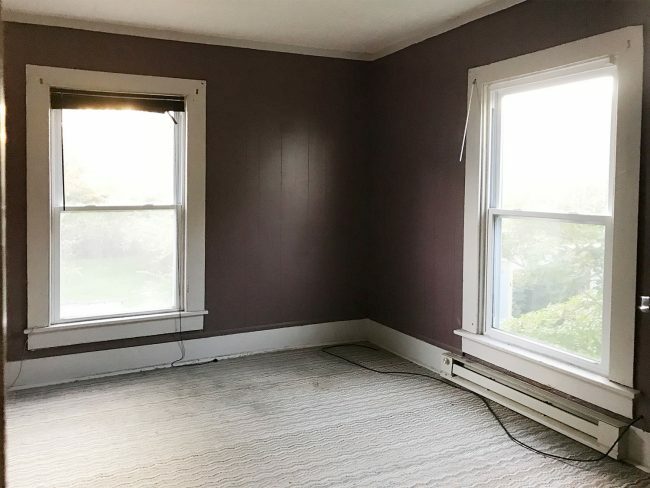 We have a working theory that someone many years ago just disguised problem areas with more and more coverings: wallpaper, foam ceilings panels, fake wood paneling, etc. So who knows what we’ll find behind them, but the pink house has trained us well. I ain’t afraid of no ghosts duplex. The bathroom sits between the two bedrooms and is, again, remarkably large for the overall size of the house. It’s also shaped like a weirdly long triangle, which is why we’d love to find a way to split it into two better laid out bathrooms. We’re still sketching alternative floor plan options, so we’ll share those when we land on something we think could work. Here it is from another angle. Is it bad that I’m actually kinda liking that treatment on the shower doors? It’s like a modesty decal. While the layout on each side is identical, the look and condition of this side is slightly better. 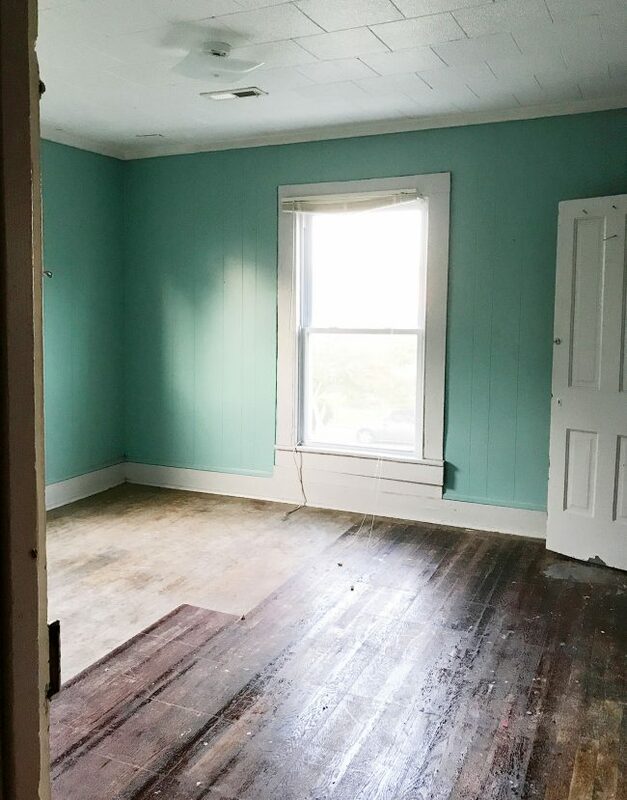 And the living room is keeping things interesting with green and blue trim. Oddly enough it has a ceiling leak along the exterior wall just like the other side, but it’s right out of frame in the shot below. This side also sports a fridge just hanging out in the dining room, and some faux greenery (you know Sherry loves a faux plant or ten). Upstairs is where things get sticky. And I mean that literally. The floors up here have a thin layer of adhesive that grabs your shoes with every step. It appears to be from some vinyl tiles that got peeled up, but the stickiness suspiciously continues ON TOP of the remaining vinyl tiles. Layers upon layers upon layers, guys. It’s a theme. I personally have not even walked fully into this room yet because it’s so sticky. Sherry’s a braver person than me, but it basically ripped her flip-flops apart when she first toured this house with the realtor. She described it as hilarious for the first minute and then just plain savage as she fought to flip and flop her way outta there without getting glue all over her feet. The stickiness stops at the back bedroom thanks to the carpet. And I can’t say I hate the wall color in here. It’s kind of a moody eggplant. But as you can see in the video, we think there’s some rot/moisture damage behind the foam ceiling panels and the fake wood paneling – but on the bright since there’s also a brick chimney hiding in one corner, so we’re hoping to expose it when we peel off all of the various other coverings. 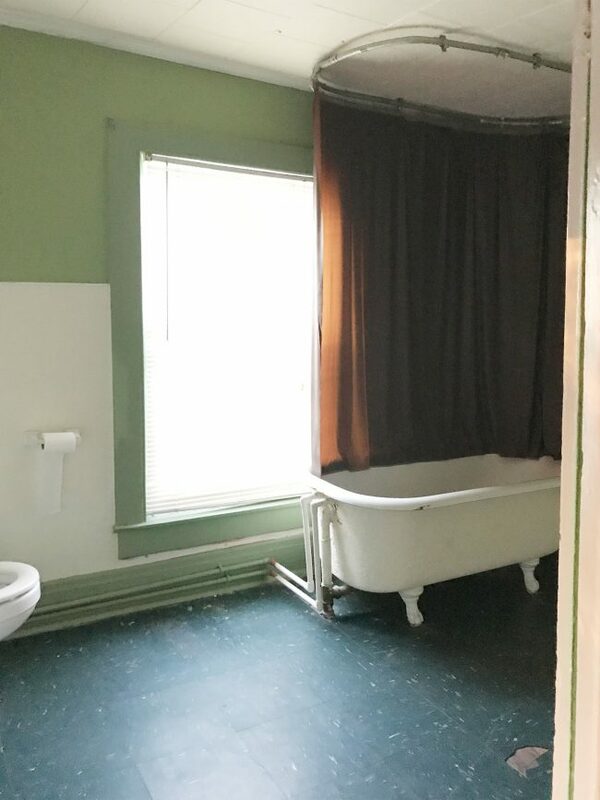 The bathroom on this side actually has a clawfoot tub in it. Were we not in the midst of fixing up our tub in the pink house already, I’d be tempted to steal this one for that house since it’s in much better condition to start. 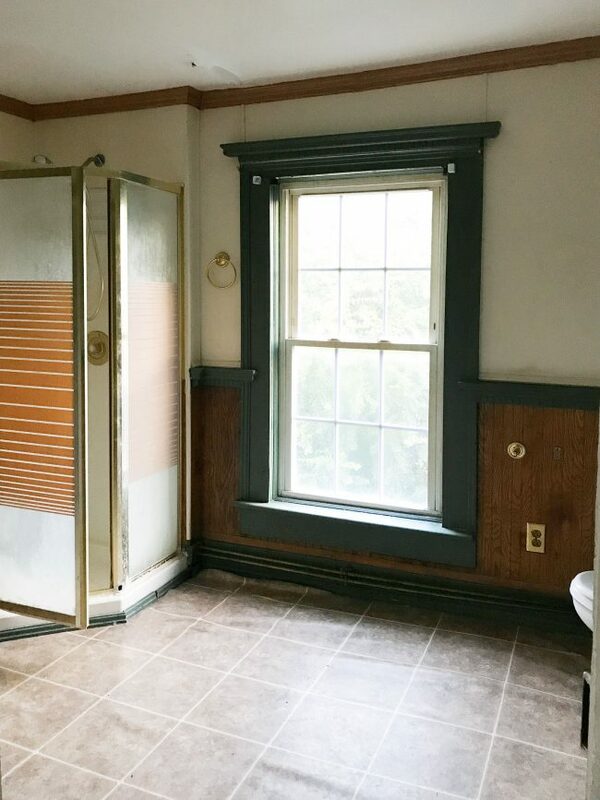 Both this bathroom (and the one on the other side) are so large and oddly shaped you could drop a 5 x 7′ rug on the floor and it wouldn’t touch anything. It’s like a skating rink of space that’s not being used. 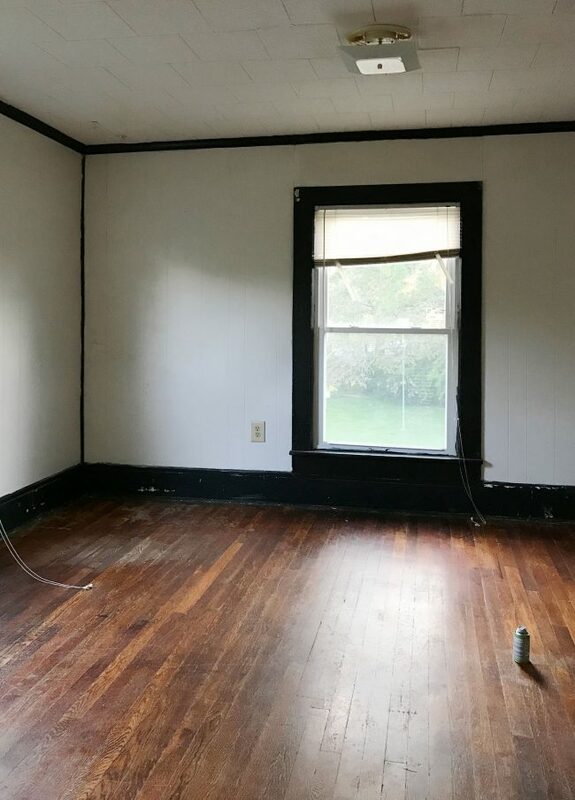 So again, the name of the game is to bring this place back to its former glory, strip away all of the strange add-ons that hide/cover various things, and reconfigure things so they make a little more sense and are hopefully a lot more like how this house was laid out originally. I’ll end this tour with the view looking back down the stairs at the front door (don’t mind the mylar “Happy Birthday” balloon that lives on this side of the house – it’s like a less sinister version of the red Pennywise balloon). Picture the left side of the stairway wall taken down so that it opens into the living room (again, sort of like this). Our contractor thinks we can do it so we’re itching to get started. 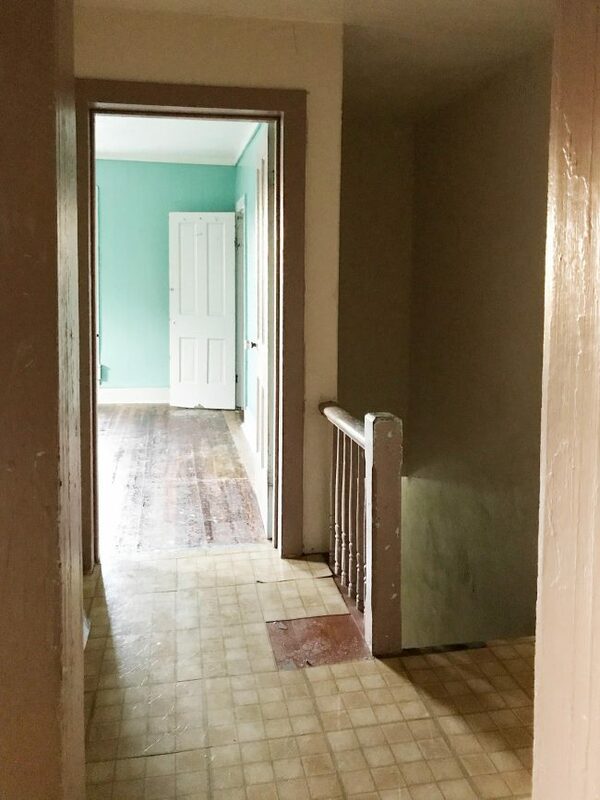 Right now we’re in the excitement / daydreaming phase of this renovation. We don’t have any immediate plans to start knocking down walls yet since we’re trying to wrap up a few things on the pink house first (it’s so close to being done we can taste it!). But as you can tell, we’re certainly deep into brainstorming what this house COULD look like and how we could give it all the love it needs. Because it needs some serious love. And also some serious deodorizing. No one is sure of the exact year this was built (one local historian guessed the 1880’s, which might be a stretch, but we know it’s at least 100 years old) and it has certainly seen some things over the years. We plan to work with the same contractor we have used on the pink house (he’s already brainstorming floorpans with us!) since we’ll need to do a lot of the same whole-house updates we did to the pink house: all new plumbing & electrical, new HVAC system, new roof & siding… THE WORKS. But our main decisions at the offset are: (1) how do we maximize the floorplan and (2) how do we make the front more attractive. Sherry found this inspiration photo online and it’s definitely not identical to ours, but comparing them at the same angle like this definitely convinced us there’s plenty of charm to unlock here. We also came across another duplex a couple blocks away that helped us “see” how ours might fit into town once we fix it up. Picture this one with mint green shutters and doors like this – or maybe wood doors and these shutters? Or maybe this color for the shutters? Please stand by as we flip flop more than Sherry’s sticky flip flops trying to make it out of that bedroom. It was like human flypaper, folks. 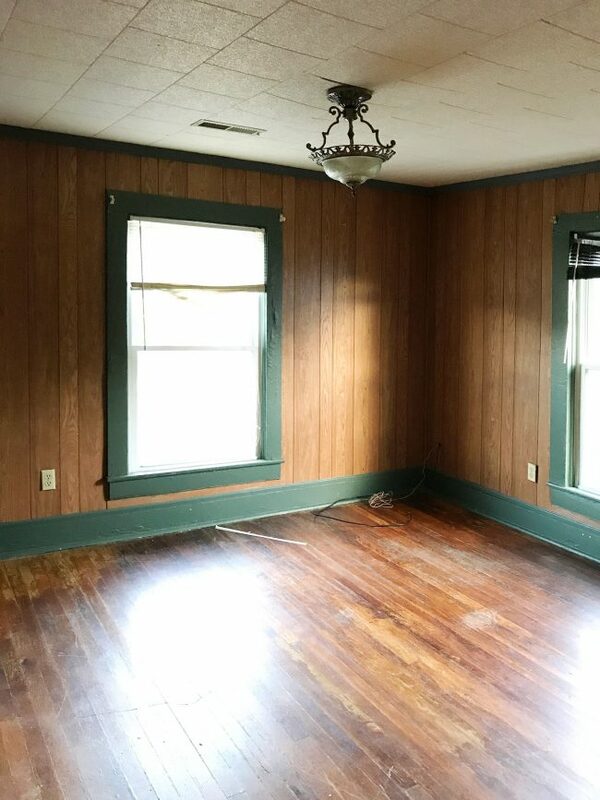 Unlike the house above, which appears to have its original decorative details (how awesome is that ornate trim under the porch ceiling?!) we learned that the decorative trim on our house is far from original and was probably added pretty recently – especially the wagon wheels) so we’re thinking that’ll go. But we do have those cool diamond windows in the middle which, get this, are currently covered over with plywood inside (!!!) to make for more closet space. No way those things are staying covered up!